Are LEGO Mystery Minifigures the latest Beanie Babies/Tickle Me Elmo kind of "scarce" commodity? You might think I was trying to score some OxyContin. I plunked down 11 yellow packages on the counter and the cashier stared me down: “So sorry sir, the limit on these is five bags per person per day.” I was thinking about choosing the “Don’t You Know Who I Am?” path and flashing my LEGO VIP card. But nerves got the better of me. Perhaps I should have been grateful for the opportunity to purchase even a few of these $1.99 Mystery Minifigures at the Burlington Mall LEGO Store. I was beginning to think that they might not exist. The LEGO Website has been sold out for weeks. I’ve struck out during multiple visits and follow-up calls to my local Toys R Us, Target and Wal-Mart. Every store I check assures me that “a truck is coming in” later in the week, and when I call back, I hear about a nebulous “other truck” that’s on the way. How am I ever supposed to collect all 16 figurines if LEGO won’t let me buy any? 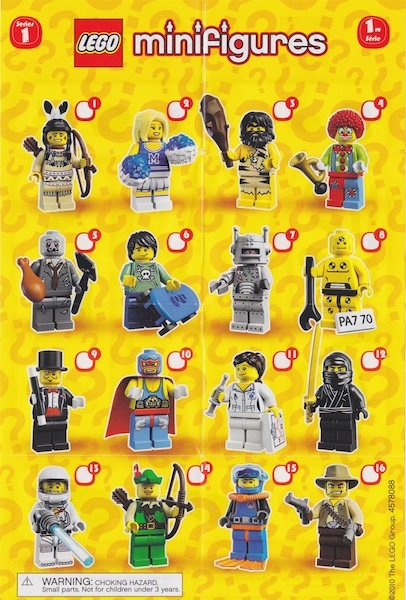 The limited edition LEGO characters are the 2010 edition of the Village People. The gang includes a Native American hunter (I’m convinced it’s a braided huntress, while my 8-year-old insists it’s a guy), a robot, astronaut, ninja, crash test dummy, caveman, professional wrestler, cheerleader and zombie businessman. This scavenger hunt began as a quest for my son, Ari, but his needs are in the rear view mirror now. This has become my mission. I want to see how we can incorporate Paul Pierce, Darth Vader and Harry Potter LEGOs into an interactive scene with these new career professionals. Perhaps the necktie-wearing zombie can symbolize white collar criminals, an ignored demographic in the toy world. LEGO Mystery Minifigures have given Ari a lesson in supply and demand. As with cereal prizes, the threat of duplicates lurks in every package. In five tries, he received three deep sea divers, Robin Hood and the androgynous Native American. Like every other elementary school student, Ari also is addicted to Silly Bandz, those molded elastics shaped like wild animals, hearts, vampires, musical instruments and alphabet letters. He tells me that his Pegasus is “extremely rare” based on some suspect anecdotal data. You have to give Ohio-based Brainchild Products for pulling off the Marketing Coup of the Century. The only more impressive sales feat would be to package a piece of twine with instructions how to magically transform it into a snake or an eel or a worm. I would never give up my work lunch hour for Silly Bandz like I did for the Minifigures. The Burlington Mall is 30 minutes roundtrip from my office — leaving 10 minutes to sprint through the mile-long parking lot, 10 minutes for mall navigation and 10 minutes for shopping. Do I feel like a willing marketing victim? Absolutely. I’m certainly no different from the crazed parents who take off work to hunt for Silly Bandz. Part of the allure for me is that LEGO is refreshingly politically incorrect when it comes to weapons. Most of the mystery characters are armed to the teeth, making them contraband at that Rhode Island school that outlaws little green army men for security reasons. The latest LEGO arsenal includes bows and arrows, a prehistoric club, cowboy pistols, ninja swords and the most incongruous weaponry ever put in the hands of a corporate zombie — a shovel and a roasted chicken drumstick. Now all I have to do is get my giant hands on them.